Sacha Christie - Infomaniac Housewife: Left Out at East Gate. 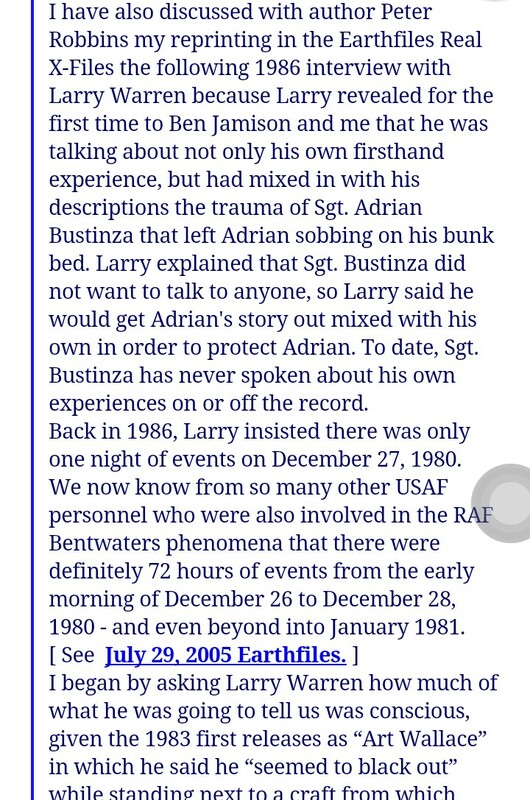 The truth about Adrian Bustinza and Larry Warren. Left Out at East Gate. 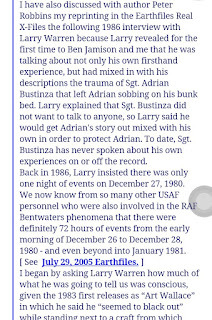 The truth about Adrian Bustinza and Larry Warren. Something has come to light that proves the age old rumours that Larry Warren stole his testimony from Adrian Bustinza are true. In a recent radio interview, for the first time ever, Adrian speaks about the events as they happened to him on that fateful weekend in 1980. He testifies to briefly seeing Larry Warren in the field. Larry told a commanding officer that people were taking photographs, he and Adrian were ordered to remove the cameras from everyone which they did. Now at this point Larry tells us that he and Adrian were together, that they were instructed to approach the bright object on the ground and walk ten paces to the left, then ten to the right. 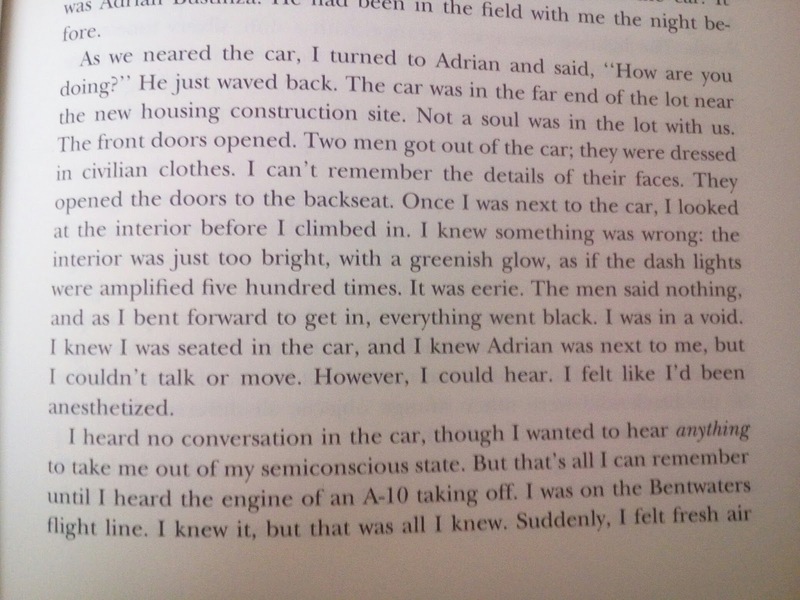 As the book Left at East Gate goes on he tells us of him being approached, told to get into a car, gassed, shoved in the footwell and then onto the building on the Woodbridge base where he and Adrian were both taken inside, shown footage of ufos and they were told that bullets are cheap. According to Adrian Bustinza, as soon as they had taken the cameras from people, Adrian and Larry parted ways and Adrian and John Burroughs left the scene together. What ensues is the very same story but it doesn't involve Larry and Adrian, it involves John and Adrian. Adrian says the first person he bumped into the next day was Larry Warren. Adrian was then taken alone to Woodbridge, taken into the building where the photography shop was situated. He was taken alone into a room with three men and was asked over and over again what he had seen. The officer told Adrian he was mistaken and that he had merely seen the lighthouse. Adrian argued his point for quite some time and finally asked what the consequences would be if he did not say it was a lighthouse. The reply was "Bulets are a dime a dozen, bullets are cheap". The very next thing he did was to leave a note under Larry Warrens door and then told him absolutely everything. He then called his mother. Adrian that is, not Larry. Now Larry admitted this to me recently as we took him in when he made himself homeless. He also told me this when I asked him a question about Capal Green. He said "the craft wasn't at Capal Green, it was at the other side, I got mixed up". I was confused and asked what he meant. He repeated himself and said i thought I got the right tree but I got mixed up, it was at the other side". Still confused by what he was telling me, I mentioned a few different places in that same area, having been to the forest four times over the past 8 years with Brenda Butler, I know it well. He said "No, you haven't seen it". About three days later my partner threw him out of our home for many reasons. It played over in my mind for a few weeks, trying to piece together what he was saying. While living here he asked me about twenty times if I had listened to the Bustinza show. I hadn't. I was saturated with it all, Larry never ever talks about anything else. I had heard enough. Recently I decided I needed to listen to this inteview properly because his story started changing after it had been aired. Why would he be saying that the craft was not at Capal Green? Because Adrian says that when they were told to get over to Bentwaters they were told to turn RIGHT at East Gate. You don't have to take my word for it. If you know Left at East Gate then everything you hear in this interview, you will recognise as being the testimony of Larry Warren. You will realise that what you have read in LAEG is a combination of Larrys bit part and the rest is about Adrian and also John Burroughs. John was asked to walk towards the craft by Col Charles Halt while Adrian was with him, not Larry. Final notes for now. Recently Gary heseltine released his findings on the analysis of Larrys letter to his mother. 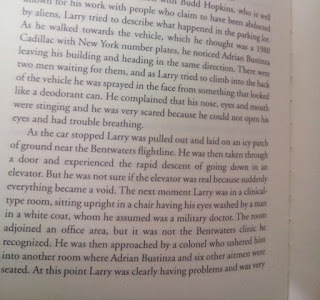 The only thing unexplained is why Larry doesn't talk about himself in it, he only mentions that it happened to "some guys". He also states in LAEG that just before things were starting to happen, when he was alone at his post that the guard mount was boring as usual. Thing is... He was on his very first shift ever. How would he know it was boring as usual and why would you even say that unless you wanted to give the impression you had been there some time? Why hide the fact it was his first shift? Also why have this incredibly violent reaction to me saying that I would be attending a conference he is speaking at to ask him a question? The question was obviously about Adrians testimony. 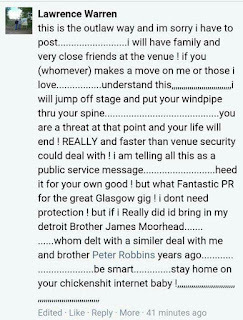 Larry states I am a threat and wants to end my life by putting my windpipe through my spine. He has also stated elsewhere that I am the most dangerous woman he's ever met. Interesting choice of words I am sure you will agree. He is obviously not physically threatened by me, nor is he averse to hitting or threatening women. I have been barred from the conference so I cannot ask Larry myself. 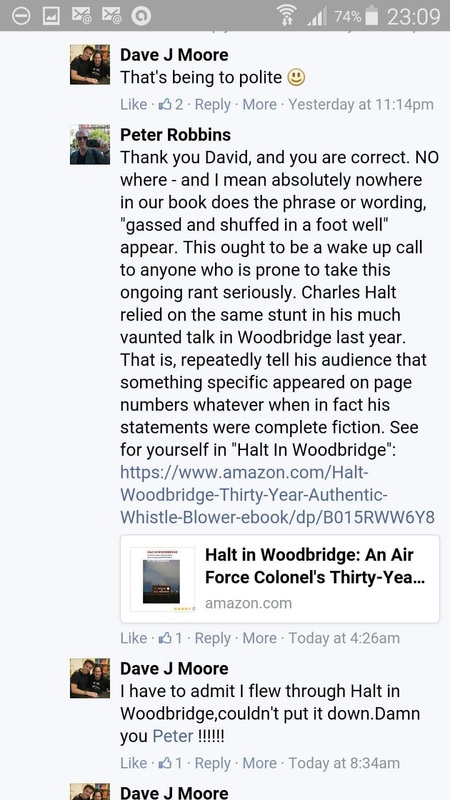 I remember not so long ago Larry creating a lot of noise for being barred from the Halt in Woodbridge conference. Irony or hypocrisy? Not one of the organisers at SPI Scotland have told me I am barred. They haven't got the balls to tell me themselves and left it to the grapevine! Funny thing is, I was never going, I just wanted to see if I'd get barred to show Larrys hypocrisy. I never dreamed it would be delivered in this manner. If I am the one lying, why care about what I say if the data speaks for itself. This is a screen shot of part of an email sent to me by Linda Moulton Howe regarding the transcription of a recorded conversation she had with Larry in 1986. I will leave it here. You decide for yourselves. It has been brought to my attention that Peter Robbins laughed off my comments about Larry being "Gassed and in a foot well" and smugly announced "nowhere in our book dgoes it say... "
Obviously I have no idea what I'm talking about. Peter must think Larry walks around quoting excerpts of the book verbatim rather than having conversations using his own colourful vocabulary. LAEG is only ONE of MANY books written about the incidents. Adrian Bustinza left a comment today on a thread about this blog. "Our brothers who are bent on taking ownership and credit for something that others experienced" "John and I! not "Larry and I"
Spot on. Drew the same conclusion after that interview. It makes more sense now, that at any othertime in regards to his testimony. Take a bow Mr. Bustinza for being as forthright as you possibly could, considering the live circumstances of the interview. Indeed. It was very brave of him considering the toxic atmosphere that has been engineered around the subject. Hopefully more will feel comfortable coming forward once the word gets around. As Larry said himself, take him out of the story and there is still a story. Tip of the iceberg. There's much more to be discussed and not by me either. His house of cards is collapsing. I found Adrians account fascinating. It must have been so deeply unsettling. Glad he came forward. The show he did with John is stunning innits own right even if you take my angle away. They all deserve better than to be railroaded by one man and their own military. Please make your mind up Sacha - Last year you were trying to convince everybody that the whole Rendlesham incident was all a military experiment of some description. Whatever the truth is, Larry has to be commended for getting the story out in the first instance. Everyone in the UK UFO community has dined out on Larry's story for over 30 years - some of the L W haters have even sold books and made money from public speaking on the subject. I have to agree though, his Facebook rant looks harsh, although I'm sure there are two sides to the story as they say. Please remember, all Americans wear their hearts on their sleeve, and come out fighting hard when feel intimidated - I know, as I spent years in the US and got to understand the mentality of the people first hand. Actually George it was four years ago and it all still stands. The only thing that has changed is that my theory is really based on Adrians account not Larrys. If you listen to Adrian speak you will have the same penny drop. Larry has no story, it is HE who has dined out on other peoples accounts for over thirty years. 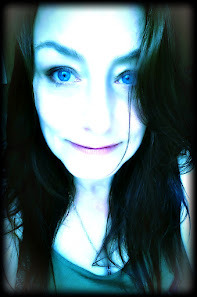 I have never spoken about this publicly, I have spoken about my OWN experiences publicly. Larry was happy to free load us and now complains I am making gains on his back? No. I don't take payment for anything I do and I never have. When it comes to Rendlesham there are far more than two sides to the story, yet it seems only one person screams about it. Threatens people constantly for asking him questions about what happened to him. He recently stated that he met John Lennon in November 1980.. How is that even possible? He is a man made entirely of lies and psychotic aggression. Thank you for your post. I think if you actually listened to the show instead of picking on something you think I have done then you might actually know the truth. 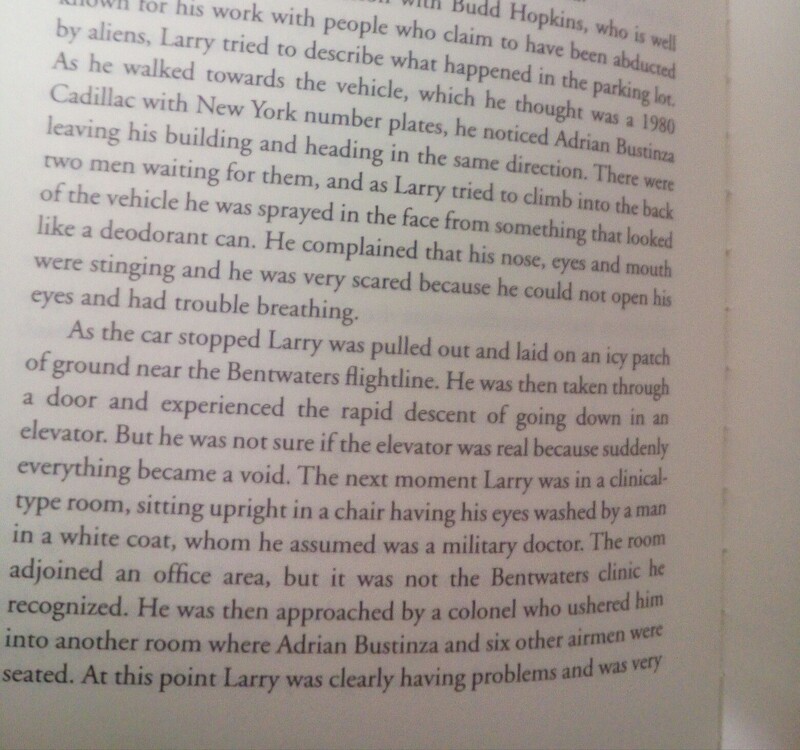 Adrian was alone, Larry stole his story. Those are the facts and they came from the horses mouths. My mind was made up four years ago on events and remains the same, only it played out with different characters than has been SOLD £££ for decades. Relax Sacha, I never stated or meant to imply you are a freeloader or in it to make a profit, I was referring to somebody else from the UK who is all over the subject like a rash. I just get the impression that the Rendlesham story keeps getting dragged up every so often - why? The only people who will really confirm what happened back in 1980 and to whom, is the governments of the UK and USA - This will never happen in my opinion, so no doubt this debate about who witnessed what will rumble on after we have all gone. I was intending to go to my first ever UFO conference in Holmefirth later in the year, but I think I shall stay at home - There's enough fighting to be found in Bradford if I want to go and look for one! Many thanks for letting me have my say without deleting the post. No offence was ever intended. My apolohies. The story stays the same essentially but perspectives have changed. Since the advent of the internet and new witness accounts becoming public, it need to change. It needs to change in a way that makes sense. The whole future people thing is so toe curlingly flawed. Larry hasn't spoken properly about his own involvement for a long time. He plays a video or gets someone else up to speak.I have even seen him arms folded in a silent sulk while Peter did all the talking. Larry recently wrote Brenda Butler and Dot Street out of the picture claiming he got the memo out and he didn't speak to the News of the World when we know he did. He got the tape from his visit to Japan, he didn't get it out. It changes to suit the agendas of others. The truth doesn't see to be important anymore. LW has screwed the whole RFI story. He has written himself into something and stolen Bustinza' experience as his own when all the evidence suggests he was not there, or at best a peripheral witness. He has changed his story over the years, culminating in the radio interview which also featured Bustinza where he is audibly sweating and incoherently jive-talking before AB comes on. ("Others to some faint meaning make pretence, But Larry never deviates into sense"). 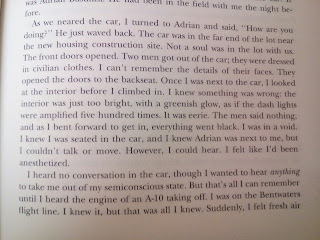 During that session he admits he appropriated Adrian's experience as his. He is also relieved when AB does not call him out. A big part of the problem over the years has been the misplaced loyalty of the USAF personnel to each other. Even when they know one of theirs is bullshitting they don't call him out. Until now. AB has come as close to naming LW as being a liar as is possible without actually doing it. For the sake of his good and immortal Catholic soul he needs to go all the way now, and correct the sin of silence and omission he has committed for 35 years now. LW's lies have cased enormous harm to individuals and done irrerperable damage to the RFI truth. The damage is so great he might well be an agent of disinformation. His disgusting threats to a woman have no "other side" to their narrative. He is a vainglorious little bully who promises to bring on his big, bad buddies who may be as fictional as his other dubious claims. Anyone who believes this man has not studied the full story. Anyone who gives this man a platform is shamefully complicit with acts of violence against women. 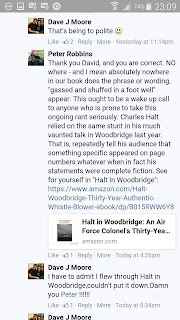 Thank you for seeing things as they are.Maybe I am not the only person Larry Warren has threatened to put their windpipe through their throats? Or worse? He claims to have his brothers who apparently would ride half way across the world to beat someone up for asking him a question. His reach is long as he says. Maybe they just didn't want to be publicly smashed to pieces. The time to set the record straight has got to come. The people who know the truth must be respected and protected otherwise we will never know the truth. I do not believe he was there, I know him, I now know how he lies. I know how he has badly written himself into the beatles story. I know he sold that John Lennon sketch he says May Pang gave to him when they were in a relationship, only she not only didn't recognise it, she said it was a fake. If she had given it to him then she would have recognised it. He states on an auction site he was in a relationship with May Pang in 1974. He was 13. He is a man made entirely of lies and has run roughshod over every person who could have pieced together the real story. Left at East Gate is a stolen account and mish mash of various peoples experiences. Adrian as good as said in his response, Larry was not there. I hope he feels able to come forward without fear and tell us if this is the case and know he will not be judged for being under the weight of Larrys lies for over three decades. Peter Robbins can witter on about his book all he likes. He seems to not realise we had conversations and that book is not my only reference material. Laughing at me for saying he was gassed when quite blatantly Georgina wrote in You Can't Tell The People he was sprayed in the face and sedated.My production of the evidence I hope was a kick in his vernaculars. This is the biggest con in ufological history and all those genuine witnesses have not only lived it, but lived watching this tornado of lies and abuse. Thank you John. Great to hear from you. It is all a bit vague at the moment but I am putting together a comprehensive list of problems with the various stories he tells, and they are just that, stories. I think things will become a lot clearer soon. If you read Left Out at East Gate on here (if you haven't already), you will see Adrian Bustinza does not disagree with anything I say and also he thanked me.